Stacking a washer and dryer is a popular way to save space, but what do you need to consider when you have stackables? Are there disadvantages when you need repairs? There are several things to think about before you adopt this solution for your laundry. Stackable washers and dryers enable you to put your laundry machines into a small space, even a closet. When you buy appliances that are the same brand and model, the result can be a very sleek-looking unit. Some compact appliances are made to be stacked, but with the right hardware, it is possible to stack any appliances that meet certain criteria. For example, you need to have frontloading appliances and the dryer controls must be reachable. By stacking appliances, you save square footage on the floor by using the space vertically. This means you lose the option to hang a storage cabinet above your laundry appliances and can’t fold clothes on top. In a small apartment or condo, you may have minimal floor space, which makes stackable units your only alternative, but when you have more room, you may want to consider whether having them side-by-side would give you more options. When you stack appliances, you concentrate a large amount of weight on your floor. For compact appliances, this may not be an issue, but if you stack full-size appliances, you may need the advice of a building contractor to verify that your floor can take the weight. If not, you may need the floor reinforced to accommodate heavy stacked appliances. 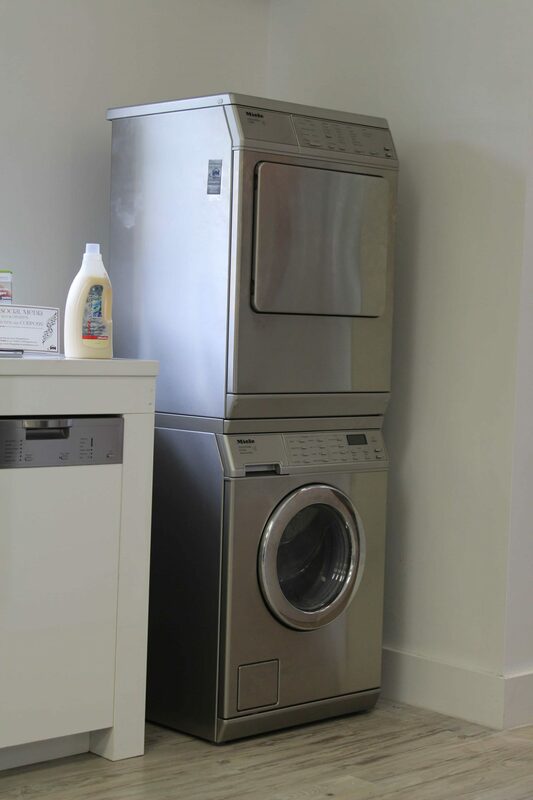 When stacking appliances, there is special hardware necessary to keep the dryer in place atop the washer Once in place, there can be considerable vibration when the washer spins that looks like it could make the dryer slide off the top. Manufacturers insist that violent shaking of the machine is not normal and could be the result of improper leveling, a weak floor, or failure to replace shipping bolts put in place by the manufacturer to protect the units during shipping. In some cases, placing anti-vibration pads can help the problem if there is no other cause. When it comes time to repair your laundry units, is having them stacked a problem? In comparison to having an all-in-one unit that contains a washer and dryer, having separate units affords you the ability to replace one appliance and not the other. Repairing them individually requires that the repairman unstack them to do the work. This can make the repair a two-man job that adds to your costs, but most repair companies prepare for working on stackable by bringing an air sled and an oven dolly that can move heavy appliances and remove stacked laundry items, built-in ovens, and other raised appliances. Houston Appliance Repair, which serves the greater Houston area, is well-equipped to work on all brands of washers and dryers. We handle stackables with ease. Whether you need help installing your new laundry set or need your washer or dryer repaired, don’t hesitate to contact us at (713) 574-9799 to set up a convenient service appointment. While the average refrigerator may have a lifespan of eight years or less, Sub-Zero refrigerators can last for decades. They can experience problems, like any other appliance, but a combination of built-in reliability and regular repair and maintenance will help them live up to their potential. Unlike other double door refrigerators that might cost a couple thousand dollars, Sub-Zero models start over $7,000, which makes regular care necessary to protect your investment. What makes this brand of refrigerator so pricey are its many built-in features that set it apart from other refrigerators. Dedicated units: Most homeowners prefer combination refrigerator-freezers, but Sub Zero models are available in all-refrigerator or all-freezer models. In addition to the regular-sized units, you can even buy a modular refrigerator or freezer drawers that can be installed below cabinets for a truly custom setup. Patented air filtration system: Produce and other foods give off ethylene gas which can lead to spoiling, wilting, or discoloration. The filtration system in a Sub-Zero prevents this, while also removing bacteria, mold, and viruses and reducing odors. Better sealing on the doors: Heavy insulation, tight hinges, magnetic gaskets, and triple-pane glass on Crestor models keep food fresher by creating a vacuum that preserves the food. Microprocessor control system: Adding to the effects offered by the dual compressors, these refrigerators have microprocessor control to ensure optimum temperatures in each part of the unit. You can also adjust the lighting, adaptive defrost, and cooling fan and be notified if someone leaves the door or drawer open. To get the most from your refrigerator, it is important to make sure that you perform regular maintenance and quickly call for call for service when needed. Keeping the compressors working correctly to achieve these impressive results requires keeping them clean. Unlike a normal refrigerator that has the compressors at the back, the Sub Zero has them mounted at the top or bottom of the unit for easier access. While most homeowners can manage this maintenance, you can have the cleaning done by a professional if you prefer. The unique features of your Sub-Zero refrigerator make it crucial for repairs and any maintenance you cannot do to be performed by a competent service company that offers years of experience dealing with this brand of refrigerator. In the Houston area, the factory-certified technicians at Houston Appliance Repair have been repairing Sub-Zero products for a quarter of a century. For expert service, call us today at (713) 574-9799. The microwave has become one of the most beloved and indispensable appliances in most kitchens, so when yours stops working, you want a quick remedy for the problem. Most problems with the microwave require that you call a repair company, as long as the original cost of the microwave makes repair costs worth it. The oven does not work at all, which may be due to a blown fuse or a faulty door switch. The oven does not heat food, which can indicate a defective magnetron, capacitor, or diode. The turntable does not rotate, which may be the result of a worn out turntable drive or a defective tree motor. There are sparks inside the microwave, which may be due to a defective stirrer, broken fan motor or stirrer belt, or a shorted out high-voltage diode. The touchpad does not work at all or works intermittently, which may be due to water damage or infestation by insects. It makes strange noises, which may result from a defective magnetron, exhaust fan motor, or stirrer motor. These days, it is possible to buy a good basic microwave for $100, with the average cost of higher powered models being another $100 or $200. Unless your microwave is still covered under the manufacturer’s warranty, which would entitle you to service from a factory-authorized repair shop, you might cut your losses and go microwave shopping if your unit cost less than $150. The average life of the microwave is nine years or less. When deciding whether microwave problems are worth fixing, you must factor in the cost of a service call. Replacing a touchpad can cost $50 or less, whereas replacing the magnetron, the part that converts voltage to radiofrequency energy that cooks the food, can cost into the hundreds. According to Angie’s List, the average cost its members paid for microwave repairs in 2013 was $133. If you are able to take your microwave to a repair center, you may pay less. If you have a gourmet kitchen with high-end appliances, you probably did not purchase your microwave at a big box store, and you might have one with convection and other features that might price it into the thousands. Jenn Air, for example, has a microwave wall oven with a dual-fan convection system that retails for over $5,000, while offering countertop models that retail for over $700. In these cases, calling a repair company is worth your time and money in order to preserve your original investment. Houston Appliance Repair is experienced in repairing all types of microwaves, including Jenn Air, Wolf, Subzero, Amana, Maytag, and more. If you have a problem with your microwave, contact us today at (713) 574-9799. We may be able to tell you, based on the age of your unit and its symptoms, whether it’s worth a service call. Then we’ll be right out, often on the same day, to get your microwave cooking again. When your dryer is not working right, you either need to make a trip to the laundromat, which eats up your time, or let the clothes air dry, which may leave them feeling stiff. In this Internet age, you may be tempted to look online to find out how to fix it, but diagnosing and repairing dryer problems is usually a job for a professional. What’s Wrong With Your Dryer? The solution to these problems may involve a relatively minor part, such as a fuse or may be a more major problem with the motor, heating element, portals, or thermostats. Whether the cause of your problem is minor or major, the result is the same for you: Your appliance does not work at all, or it does not work properly. What symptoms are related to which part failure? The problem is that several parts can lead to a specific problem. For example, if the dryer does not start, the problem can be a bad or defective door switch or a blown thermal fuse. Fixing a door switch might be manageable for some handy homeowners, but when the thermal switch goes, that is usually the sign of a malfunctioning thermostat or a clogged vent. You may even have a problem with the heating element. A bad fuse, thermostat, or heating element can lead to numerous problems on the list in addition to causing issues with starting. For example, they can lead to clothes getting too hot, taking too long to dry, or shutting off too soon. There are worn out bearings, seals, or belts that can cause problems with the tumbling action or make the machine noisy. Figuring out the exact cause of a problem with the dryer is a matter of methodically eliminating potential causes, and then replacing the right part. For a do-it-yourselfer attempting to take care of things, the problem is either that you have to have several parts that you might or might not need on hand, or be prepared to make numerous trips to an appliance parts store. Even if you fix the problem, you may not have fixed it completely by not replacing related parts, which means that within a short duration of time, you may be faced with another breakdown or malfunction. When you have a problem with your dryer, the quickest way to resolve your problem is by calling Houston Appliance Repair. With over 25 years of experience repairing state-of-the-art appliances, including dryers, we offer same-day service, free estimates with repair, and reasonable prices, and we come with a full array of parts to take care of the problem. We service all brands of appliances including JenAir, ASKO, Admiral, Amana, Bosch, Dacor, Estate, Frigidaire, GE, Hotpoint, Jenn, Kenmore, Kitchen Aid, LG, Magic Chef, Maytag, Roper, Sears, SubZero, Tappan, Thermador, Whirlpool, White Westinghouse, and Wolf. For dryer service, just call (713) 574-9799 to set up a convenient service appointment. Should You Call Houston Refrigerator Repair Or Buy A New Model? Faced with a broken refrigerator? A big question on your mind should be whether you should have your current one replaced or buy a new one. Refrigerator repair in Houston can be costly, but the cost pales in comparison with a new unit. Bottom freezer models should be repaired during the first seven years and considered for repair after that. Top freezer models should be repaired within three years, considered for repair within 3 to 6 years, and replaced if seven years or older. Side-by-sides should be repaired within the first five years and considered for repair after that. 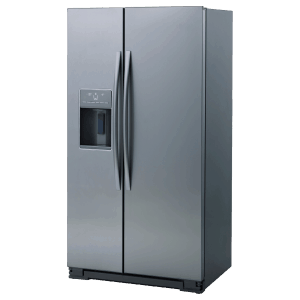 Top freezer refrigerators start at $450 for a 10 cubic foot model and approach $1,800 for a 24 cubic foot model. Side-by-side models start at nearly $1,000 for 22 cubic foot model in top $3,000 for many brands. French door models with a side-by-side refrigerator section with the freezer at the bottom range from $1,400 to over $9,000. Built-in models start in the $7,000-$10,000 range. While having a shiny new refrigerator in your kitchen might be appealing, the cost of buying new makes calling for refrigerator repair services a good idea. Do the math, you will find that you can pay an appliance repair service many times before it makes sense to buy a new one. Your refrigerator is over 10 years old. The motor is running hot. You have excessive condensation, which indicates poor cooling. You build up excessive frost in the freezer. You have a side-by-side model – this type tends to need replacement more frequently than many top or bottom- freezer models. You find a great deal on a new refrigerator. With over 25 years of experience in repairing state-of-the-art appliances, Houston Appliance Repair offers free estimates on refrigerators when we perform the work. We offer same-day service and reasonable prices on repair jobs for all brands of appliances including JenAir, ASKO, Admiral, Amana, Bosch, Dacor, Estate, Frigidaire, GE, Hotpoint, Jenn, Kenmore, Kitchen Aid, LG, Magic Chef, Maytag, Roper, Sears, SubZero, Tappan, Thermador, Whirlpool, White Westinghouse, and Wolf.